While speculations have been going around in the market, there is something substantial from the official website itself that there is going to be iPhone 4S, which will pave path for the next generation of iPhones, that is iPhone 5. Some of the noteworthy features of this iPhone 4S will include a strong backing from the iOS 5 platform, which introduces more than 200 new software features and provides you with a most advanced mobile operating interface, amazing features and rock-solid stability. This makes the not mobile perceptive users to keep up with the pace of advancement of the technology. The power of the iOS 5 could be relished using a dual-core A5 processor chip, which is one of the most processor cores and helps in displaying powerful graphics in ease hereafter, without taking much time to load. You will find how different and powerful this chip is while you are launching applications, browsing the web, gaming and doing much more than in normal speed. This makes the phone great for gamers. This phone is going to be introduced with a new technology called Siri, which permits you to use your voice to send messages, place phone calls, schedule meetings and more jobs can be done. What is interesting about the introduction of this feature is that you can use your iPhone as a subordinate by asking your iPhone to do the core jobs for you by speaking to it. iCloud in the use of cloud computing technology, which virtually increases the space on your iPhone device and is one of the best places to back up all your important info like music, photos, documents and many more. Are you holding Galaxy SII in your hands? Then you are holding one of the most vivid, slim and fastest mobile that is being offered by the mobile branded manufacturers, Samsung, the unsung heroes. Some of the noteworthy features will include a 4.3” Super AMOLED Plus display, which provides enhanced readability, a slimmer design, and they have revamped their battery, which in conjunction with this Super AMOLED display reduces the battery consumption. This phone is also built on a dual core processor, which helps in improving the speed of the applications and internet browsing, permits quick multi tasking, a smooth UI, snappy streaming and efficient gaming. This dual core processor also supports video play and recording ability with greater and enhanced efficiency. The most worth mentioning feature of this phone is the slim dimension that gives this phone an innovative luxurious design and an easy grip. The phone can also boast itself of having 3D TouchWiz UX that addsto evolutionary experience with a futuristic user interface. Many of the other important features that make this phone really worthy besides the 4.3” Super AMOLED Plus display screen, live panel which knows well and has been designed to cater to the needs of the king of the phone, which are the features and the content. There are other features like Reader’s hub, PC-like web browsing experience, HSPA+, Wi-Fi direct and many more. WOw! What a comparison, anyways, in opinion Apple is always great…………. Hey thanks for this great Comparison both are the great Phones and what to choose. its awesome. Nice comparison, definitely samsung galaxy S2 is ahead between this two. 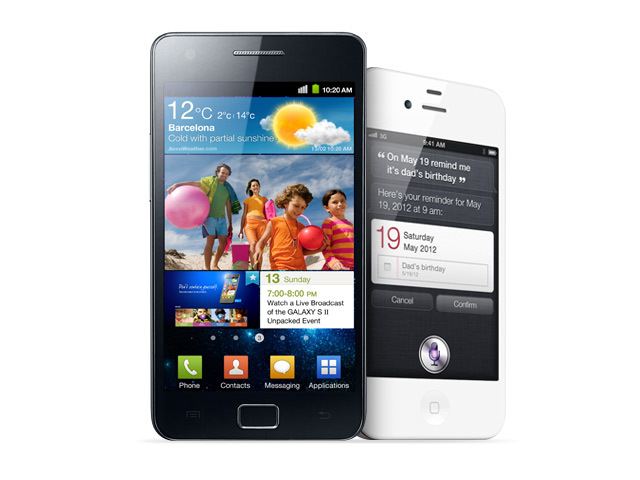 At least Samsung galaxy S2 is affordable than iPhone at this time.